Fare deal for dinner, or a fee too far? Home/Cruise Deals, Cruise News/Fare deal for dinner, or a fee too far? The denizens of LinersList, a members-only community of ship enthusiasts on Yahoo!, usually concern themselves with recalling memories of vessels which sailed into the history books years ago, or with lamenting the fact that today’s cruise ships all look the same – like office blocks turned on one side. 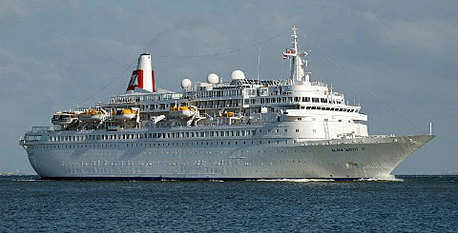 Most of them would normally look quite kindly on Fred Olsen Cruise Lines because the company operates ships – especially Boudicca and Black Watch (above) – that have elegant profiles and some heritage about them. But this week they are getting their collective lines in a twist over a new charge which it appears Fred Olsen is about to introduce. The hero has become a villain, and is being bracketed with the nickel-and-diming tactics which LinersList frequently accuses Norwegian Cruise Line and Royal Caribbean of favouring. Horror of horrors, some have even accused Fred Olsen of following the example of budget airline RyanAir. The cause of the furore? It seems passengers booking the cheapest fares will be allowed to choose their own dining time only if they pay an additional fee. Fred Olsen’s ships operate fixed sittings for dinner and unlike many competitors have not introduced a flexible “my time” or “any time” option. Passengers are allocated early or late sitting on a table with perhaps four or six companions. Early bookers can choose whether they want to eat early, usually around 6.00pm, or late, at 8.30 pm. Others might have to take pot luck, and can often be found soon after embarkation, queuing at the maître d’s desk to try to change. The most generous tippers are likely to be the ones who get what they want. So an extra £28 for a couple on a week-long bargain cruise to be able to eat dinner at their preferred time. P&O do not give passengers booking their cut-price Getaway fares the option to choose and as far as I know they do not yet have an extra-fee option. Watch this space. One LinersList contributor commented that cruise lines are following the example of airlines which discovered years ago that they could exact an additional charge for things that used to be included as part of the ticket price. “They have done it with checked baggage, carry-on baggage, seating assignments, boarding priority, etc. and there is more to come,” he wrote. “Cruise lines are always under pressure to increase revenue so I imagine we will see more of this behavior in the future, at least from the mass-market lines. “Carnival has a program called Faster to the Fun. Essentially you pay for the privilege of boarding early and having your cabin ready. This was something that all passengers enjoyed not too long ago but now it’s a premium service you pay for. Good deal, or bad deal? Is this the price to be paid as cruise fares sink lower and lower? Let me know what you think. Hello, I have recently contacted fred olsen to book a xmas cruise. I was informed of a surcharge to opt for a late dining sitting due to the fact I was booking a anchor getaway deal. The clerk stiipulated that there was no way around this charge. On the strength of the surcharge alone I did not proceed with the booking. The price you see must be the price you pay, we need to take a stance against these money spinners. Cunard at xmas for us. Olsen never again. I think FOCL will lose a lot of their regular travellers because of this very unpopular charge. Also, the restaurant waiters will lose out on gratuities as a result of guests electing to use the self service buffet rather than pay the charge. If I was a waiter I wouldn’t be pleased!